World of Warcraft players interested in getting Diablo III for free can still get in on the World of Warcraft Annual Pass, but the promotion will be ending at 12:01 a.m. PDT on May 1, 2012. 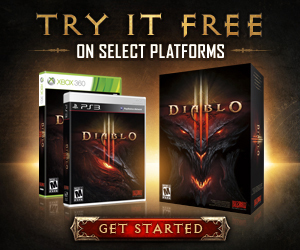 When you sign up for the Annual Pass and make a 1-year commitment to World of Warcraft, you’ll receive a free digital copy of Diablo III, an exclusive World of Warcraft in-game mount (Tyrael's Charger), as well as access to the upcoming World of Warcraft: Mists of Pandaria beta test. Learn more at the Annual Pass signup page.